Do you have any idea how much “recharge” a nurse can receive from a great laugh? Now place that laughter alongside the passion of nursing’s founder, Florence Nightingale. Together you create a magical formula that helps reach the hearts of nurses. All these, combined with talented facilitators who, themselves, are passionate about nurses staying in nursing, and you have the formula for nurse retention. In 2007, I joined forces with a couple other talented therapeutic humor professionals for the purpose of replenishing and re-energizing nurses so they will stay in nursing. 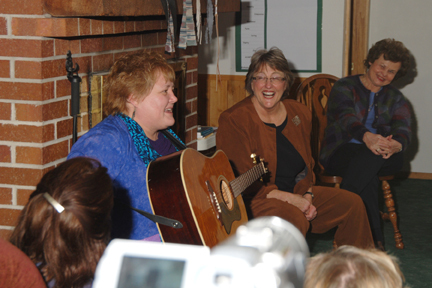 Our programs and services range from entertaining and inspirational CDs to a full-fledged retreat that immerses nurses in a day of renewal and recommitment. You can bet, with therapeutic humor professionals creating it, our retention retreat, Replenish U, can only be understood by experiencing it. It’s fun, but more importantly, it works to reconnect the hearts of nurses. There is lots more than humor at work, but for cost-effective nurse retention that works, schedule a Replenish U soon! Check out the Nightingale Expressed website to learn more about the creative, effective programs, products and services we have created. We know nurses get lots of appreciation and awards. At Nightingale Expressed, however, we bring you much, much more, including the opportunity to laugh together for highly therapeutic reasons. We do this because we want to help assure that there will always be competent, compassionate nurses at every bedside!